Our daughters have blessed us in so many ways, it’s impossible to list them all. But the one blessing I’m particularly thinking about right now is the gift of good friends. Because of our girls, and the friends they have chosen, Blake and I have made some wonderful connections with people we might never have known. The parents of our daughter’s friends have become our friends. And they have generously shared their favorite recipes with us over meals that gain increasingly in laughter and deeper meaning every time we get together. Thanks to an invitation for an afternoon of summer boating (what a treat for us boat-less people!) and grilling from Sandra and Toby, our family was introduced to these super tasty Grilled Balsamic Veggies. While we relaxed and enjoyed some fabulous casual hospitality, many grilled veggies were consumed. I ate more than my share. But I couldn’t help myself. I hope Sandra and Toby took my piggish ways as a huge compliment. Because these Grilled Balsamic Veggies were a food highlight of my summer. The trick for making these extra great, as Sandra told me, is to make sure the vegetables have plenty of time to soak in the marinade, especially the mushrooms. Let them bathe in that balsamic yumminess for at least two hours – 3 or 4 hours is even better. 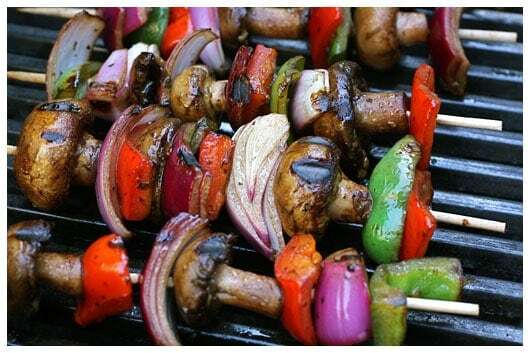 If using wooden skewers, soak in water for 1 hour before grilling. In a small bowl, combine first 5 ingredients and whisk well to create the marinade. 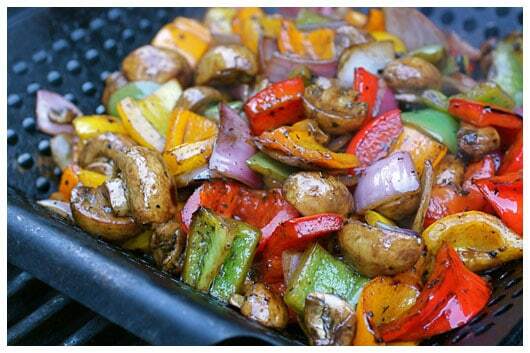 Place cut onion, green pepper, red pepper, and whole mushrooms in a gallon ziplock baggie. Pour marinade over the veggies, seal baggie tightly, and turn to coat. Place in fridge to marinate for 2 to 4 hours, flipping baggie over every half hour. Heat grill to medium-high. If using grill pan, place pan inside grill to heat up. 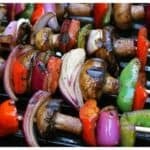 Thread marinaded vegetables onto skewers or place in grill pan. Grill until you have some lovely grill marks and the vegetables are tender, about 15 to 20 minutes. Sprinkle with freshly cracked black pepper and kosher salt before serving.